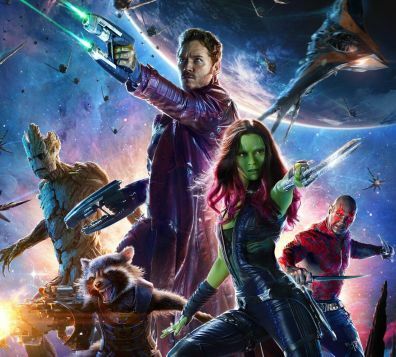 Uncertainty has surrounded Marvel Studios’ Guardians of the Galaxy since it was first announced at San Diego Comic-Con 2012. Those unfamiliar with the property thought it was the first gaping hole in the mighty Marvel machine which would certainly lead to ruin. “How can you expect audiences to see a movie with a foul-mouthed raccoon and talking tree?” was the sentiment by many, but audiences turned up in droves and made it the highest-grossing film of the year, suprassing Marvel’s other 2014 release Captain America: The Winter Soldier by over $70 million at the domestic box office. Both of Marvel’s releases this year were home runs, instant classics that garnered critical claim unlike any other pair from their stable, but after the anemic offering included in the Captain America: The Winter Soldier Blu-ray, the uncertainty reared it’s ugly head in the back of my mind. Marvel wouldn’t burn us again with a sub-par home video release on this one too, would they? Trust me, they haven’t. Guardians of the Galaxy is a stunning film, filled with natural and artificial beauty that is a testament to modern filmmaking with seamless practical and computer visual effects that blend together to create a dazzling world. The film was a sight to see on an IMAX screen, and though a home television can hardly compare, the picture is quite stunning in this release. It’s the best Marvel Studios Blu-ray, it’s visually flawless. Every crack in Groot’s bark, each line in Drax’s body, and every hair on Rocket’s head stand out with perfection, totally blowing away any imitators. If you’ve got a visual heavy movie coming out this holiday season, it better look good, because if not, “Guardians'” pristine transfer will blow it away. If you recall my Captain America: The Winter Soldier Blu-ray review, you’ll know I was disappointed with the special feature offering, which was lacking. It would seem the critical voices on that release were heard and applied to Guardians of the Galaxy as it offers a much better selection of additional content for viewers. Among them are two extensive featurettes, a gag reel, a commentary with director James Gunn, deleted scenes and a sneak peek at the upcoming Avengers: Age of Ultron. The first featurette on the release is “Guide To The Galaxy With James Gunn,” which walks viewers through the entirety of the film and offers countless details on the making of the film. Structured to hit each major beat of the narrative, and featuring 16 bit renditions of the characters and environments of the film in the style of a video game, “Guide to the Galaxy” is what you want from Blu-ray special features. Clocking in at 20 minutes long, it’s filled with extensive interviews with the cast, director, producers, and other crew members. “Guardians” fanatics will want to watch this special look over and over again. Along with it comes a featurette on the visual effects of Guardians of the Galaxy which is in essence an eight-minute look at how Rocket and Groot were created for the film. It’s not as in-depth as it could be, but we see most of the steps in bringing these two pure CG characters to life, which will no doubt be a treat for huge fans. The thing I find most interesting about this sequence though is the spotlight on Sean Gunn, who performed as Rocket on the set of the film, and though the cast and crew openly spoke about this (and only two promo images of him on set were released), this offers our first real look at Gunn performing on the set. It’s pretty stellar. It becomes clear when watching the deleted scenes from the film why they were excised. Uber fans will likely find enjoyment out of them, but overall they don’t add much to the film. Fun to look at though, in particular the scene with Rocket and Groot that wasn’t fully animated. The gag reel is plenty fun and definitely shows off how much of a blast this film was to make for the cast. As for the Avengers: Age of Ultron sneak peek, which I love being included, it doesn’t so much tell us anything we don’t already know despite giving us some new behind-the-scenes images. It’s a fine appetizer for what we’ll see in just a few short months. Though the 20-minute featurette detailing the full film is a remarkable piece, and one of (if not THE) best featurette Marvel has ever produced, it’s James Gunn’s commentary that is my favorite piece of the additional material on the release. I’m a commentary freak, and the best commentaries provide a number of things to the viewers such as insight into the process of making a particular scene, funny anecdotes from the set, things removed from the film that fans might be interested in, or “tough love” talks about making a film (ie: It’s not easy). Gunn covers all these bases and then some. From explaining things we didn’t know about Morag to which characters we may see more of in the sequel, Gunn’s “Guardians” commentary is a must listen. I’ll never forget the head scratching that came with the announcement of Guardians of the Galaxy, and though I never doubted the film would be great, I had worries about the Blu-ray release. Now, like those who doubted the film, I know that was unfounded. It’s a phenomenal Blu-ray and the absolute best home video release Marvel Studios has ever put together. Period. You can order your own copy of the Guardians of the Galaxy blu-ray by clicking here.